First up is this St. Patrick’s day lunch for Augie! 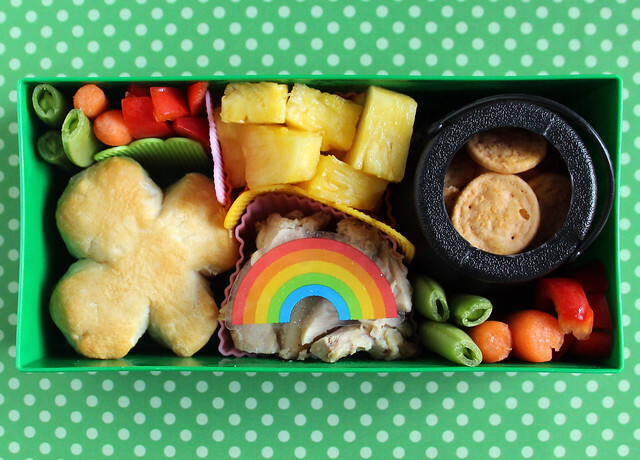 He had rainbow veggies (snap peas, carrots and red pepper slices), a shamrock biscuit, fresh pineapple chunks, leftover roasted chicken with a rainbow decoration, a pot of gold (really just Cheese Nips) and more rainbow veggies. 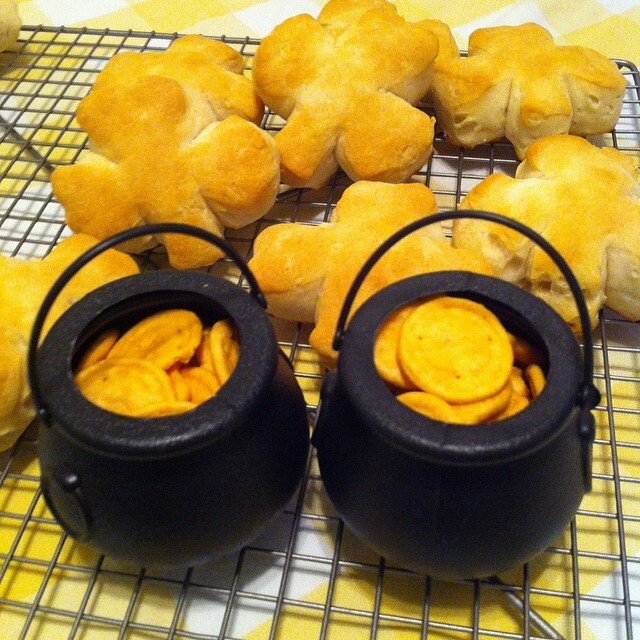 I made the biscuit by cutting refrigerated biscuit dough with a shamrock cookie cutter . I’ve done the same thing with a heart cutter for Valentine’s day before too and the kids’ love it. I bake the scraps of dough next to the biscuits. They’re ugly, but they still get eaten! I made a St. Paddy’s day lunch for Wyatt too, but he ended up staying home sick from school with a bad cough. We are all ready to be completely well again! 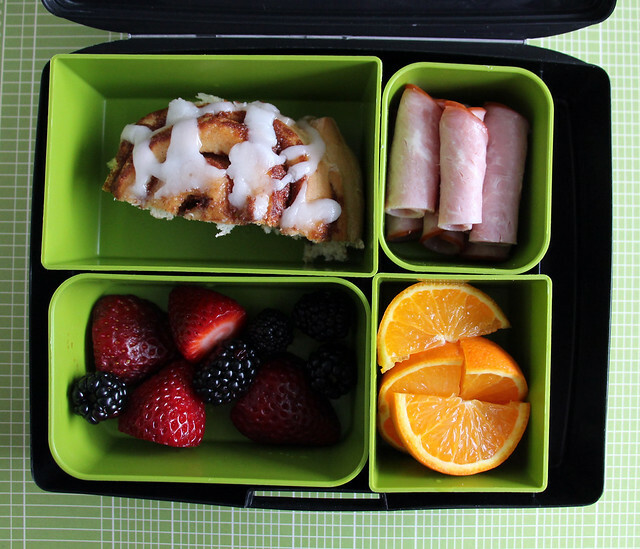 On Tuesday, I busted out my new house bento box for Augie’s lunch. You can get a better look at it in the video I made about this All Things for Sale order on my YouTube channel. He was so excited to use this lunch box and he had all sorts of ideas for filling it. “We will make a couch and a bed and a really big TV!” I was not quite up for all that thinking, so I instead I put together a lunch with a business monkey pb&j (he’s wearing a top hat, of course), grapes with dog pick, cucumber slices, carrot sticks, some ham flowers and a small container of hummus. Though the box looks small, it actually holds quite a bit. 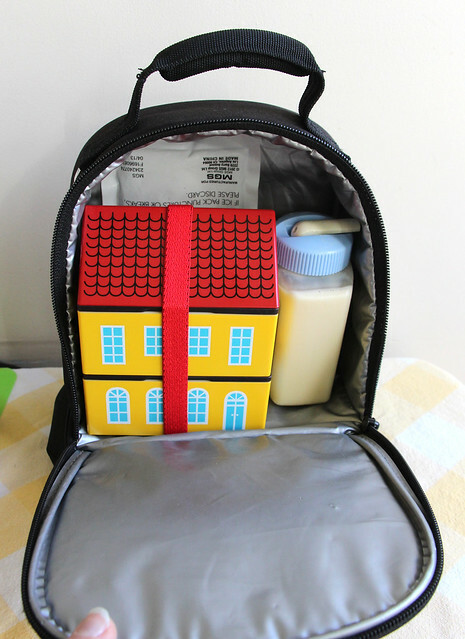 You can see what it looks like all put together and nestled in one of our lunch bags up above. Wyatt saw our new eye picks sitting on the counter and was excited for me to use them in his lunch. 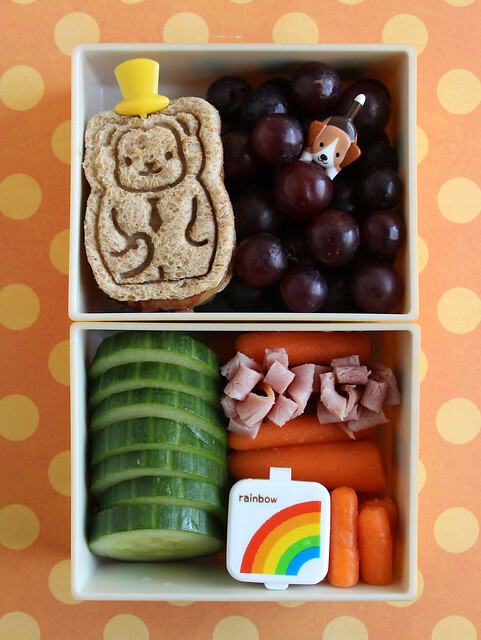 This was a big deal because he mostly prefers not to have cute lunches these days. 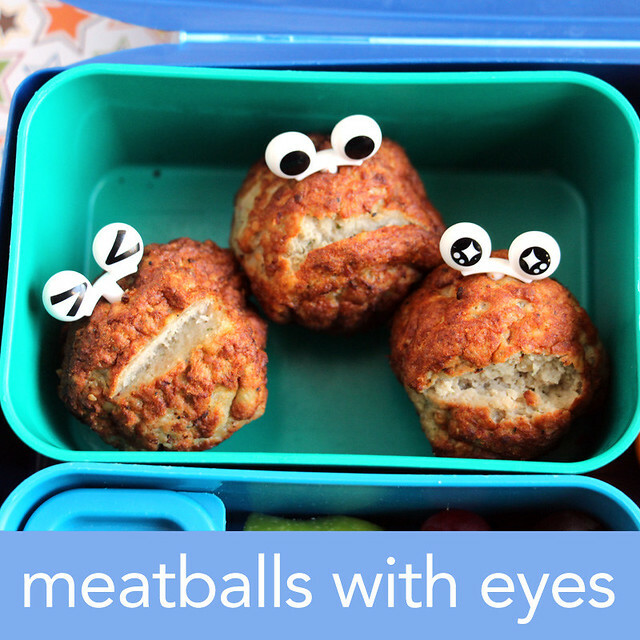 I decided to use them on some turkey meatballs and they were so fun that Wyatt wanted to continue the silly face theme through the rest of the lunch. I drew a face on some wheat thins using a food-safe marker , and then I also added icing eyes to an apple chunk. The rest of this Laptop Lunches box held ketchup (in the small box), grapes and carrot sticks. 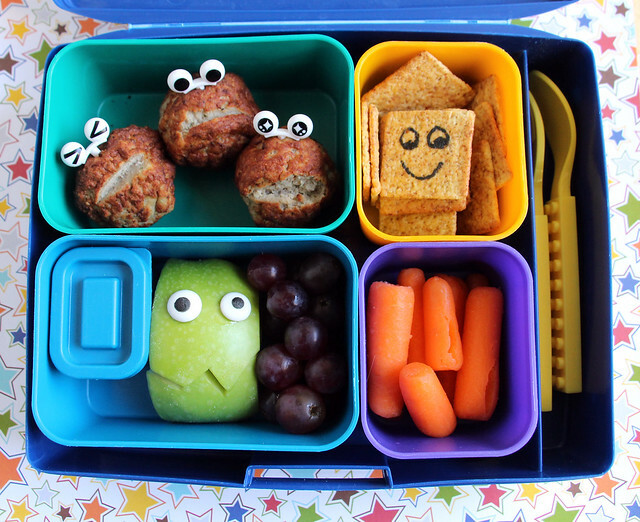 Here’s a close-up of the meatballs because they are so dang cute! I am still laughing at this picture every time I look at it almost a whole week later. After I put the picks in them, Wyatt had the idea to cut little mouths into the meatballs and I think that makes them look hilarious. 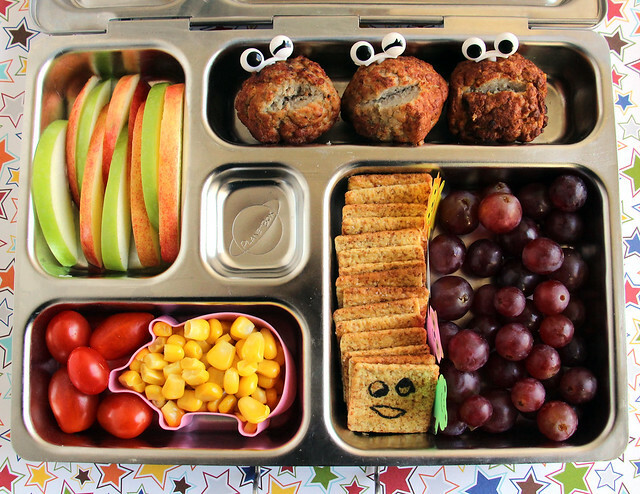 Augie’s lunch was packed in the PlanetBox Rover: meatballs with eye picks, grapes, crackers, tomatoes and corn. 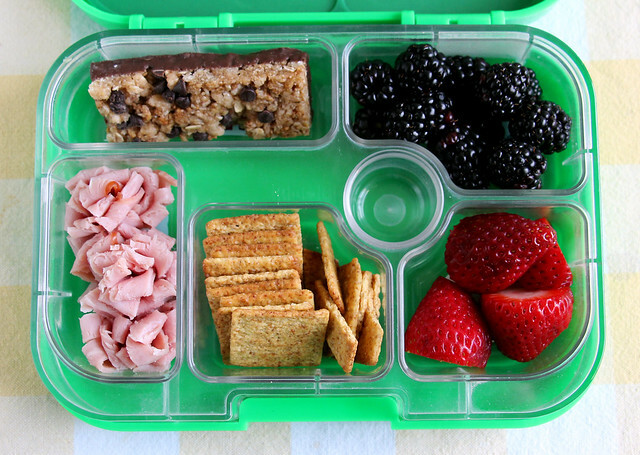 On Thursday, Wyatt had lunch in the Yumbox: a chocolate chip granola bar, blackberries, strawberries, crackers and ham flowers. This week I managed to make good looking ham flowers for the first time (see a previous failed attempt here) and I may have gotten a little too excited about them. When this lunch came home, everything was gone but the ham flowers. I asked Wyatt why he didn’t eat them and he told me his friends said they looked like “shredded poop”. From the look on his face, I could tell Wyatt agreed with his friends, but was too polite to say so. If you were wondering, this is what life is like with a fourth grade boy. 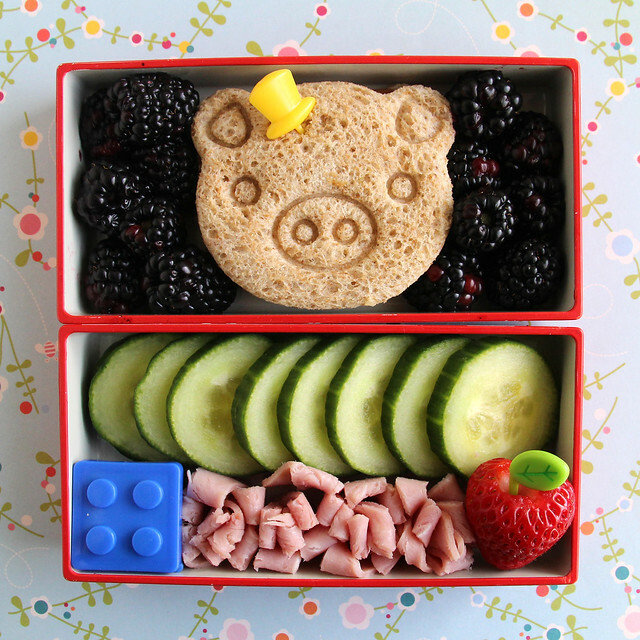 Augie had blackberries, a sophisticated pig sandwich , cucumber slices, hummus in a little Lego box, ham flowers (he doesn’t think they look like poop) and a strawberry with a fake leaf in it. Every once in a while I like to pack Wyatt a sort of junky lunch for a treat so Friday the main component of his lunch was half of an IKEA cinnamon roll. He also had ham, orange slices, and berries. This was packed in a Laptop Lunches box. 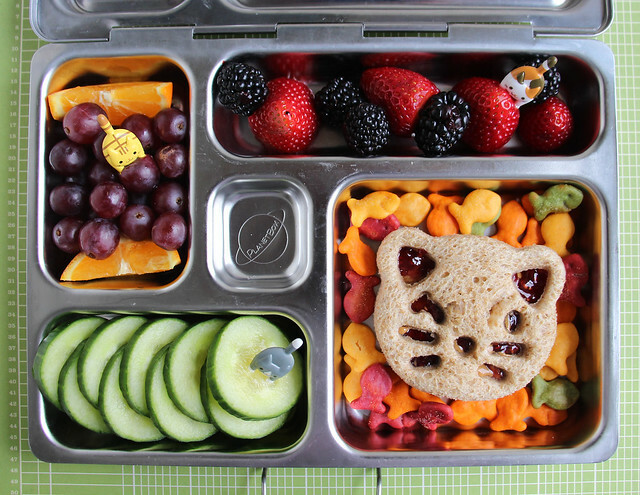 Augie wanted a kitty lunch, and a kitty lunch is what he got! He had orange slices, grapes, berries, cucumber slices, a kitty peanut butter and jelly sandwich and some goldfish (for the cats to eat!). I stuck some of these cat picks in all of the fruits and veggies and packed it all up in a PlanetBox Rover.